A high-profile chipmaker, an aristocratic consumer-goods purveyor, and a specialty REIT all lifted their payouts last week. We're still in the wake of calendar 2017's first earnings season. So it wasn't surprising to see a raft of dividend raises last week, especially considering that this year has already been stuffed with lifts from every conceivable type of company. Here are three notables out of last week's crop. Following through on an earlier commitment, Qualcomm (NASDAQ:QCOM) has formally declared a new payout of $0.57 per share, an amount nearly 8% higher than its predecessor. Qualcomm's most recently reported quarterly results show that its business is still robust, despite several tough legal battles and a looming acquisition. The company's revenue continued to rise, increasing by almost 4% on a year-over-year basis to $6.0 billion. Adjusted earnings zoomed ahead by 23%, landing at $1.8 billion. That, by the way, shakes out in a very healthy net margin of 30%. 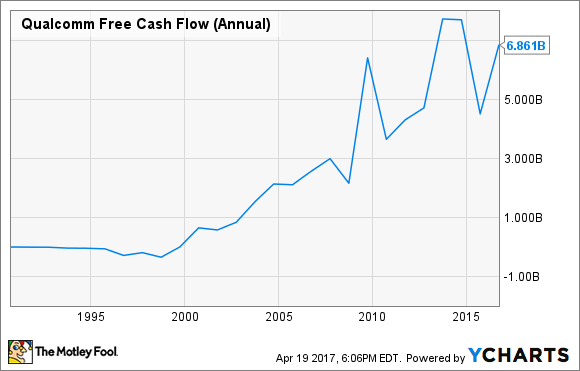 Income investors might be wary of Qualcomm, as the company loves to spend its money -- at times, its dividend payouts and share buybacks have exceeded free cash flow. Compounding that matter, the company should soon close the door on its acquisition of European peer NXP Semiconductor (NYSE:NXP), a deal with an estimated enterprise value of $47 billion. I, for one, wouldn't worry. First, Qualcomm committed to its dividend just after signing the NXP Semiconductor deal. Second, those consistently high margins pump out a lot of cash, with operating cash flow in certain years approaching the $9 billion level. The new dividend will cost the company only about one-third that amount. Qualcomm's upcoming payout is to be dispensed on June 21 to stockholders of record as of May 31. At the most recent closing share price, it would yield 4.3% -- more than double the almost 2% average of dividend-paying stocks on the S&P 500. The dividend aristocrats -- the small, vaunted group of stocks that have raised their payouts at least once annually for a minimum of 25 years running -- don't get much more regal than Procter & Gamble (NYSE:PG). The consumer-goods powerhouse has one of the longest raise streaks on the market, and it just lengthened it by another year. Its 61st consecutive annual lift is a 3% bump to just under $0.69 per share. Today's Procter & Gamble is a leaner and more focused company thanks to cost-cutting and a years-long run of asset sales. These have kept profitability afloat despite uninspiring top-line growth. Yet the company still has an immense portfolio, so it can compensate for weakness in certain product categories with strength in others. The healthcare segment was the star of the most recently reported quarter, delivering 5% year-over-year net sales growth against the 1% drops of each of Procter & Gamble's other four product categories. So although free cash flow has dipped lately, to below $10 billion on a trailing-12-month basis, the company should continue to have more than enough dosh to keep that dividend raise streak alive. Plus, it's committed to returning nearly $20 billion to shareholders annually through 2019. 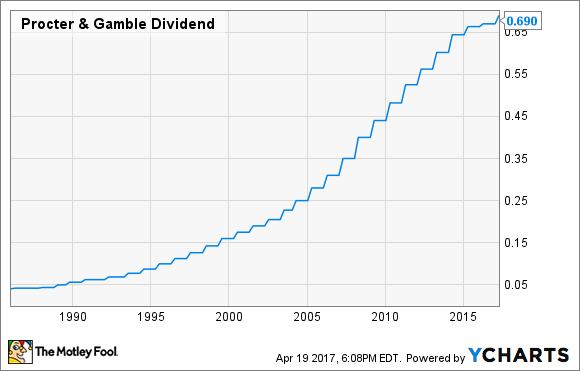 I wouldn't worry about the future of this dividend, then. Procter & Gamble's new distribution will be paid on May 15 to investors of record as of April 21. It yields a theoretical 3.1%. Specialty real estate investment trust Hospitality Properties Trust (NASDAQ:HPT) is adding a penny to its quarterly payout, lifting it to $0.52 per share. That works out to a 2% raise. As its name implies, Hospitality Properties Trust specializes in hotels and other traveler lodgings. At the end of last year, it owned or leased over 500 such facilities in the U.S. and Canada. Business is humming along these days for the REIT. Last month it reported its Q4 and fiscal 2016 results, both of which showed improvements in revenue and profitability. On the top line, the company took in nearly $2.05 billion, 7% higher than the 2015 result. 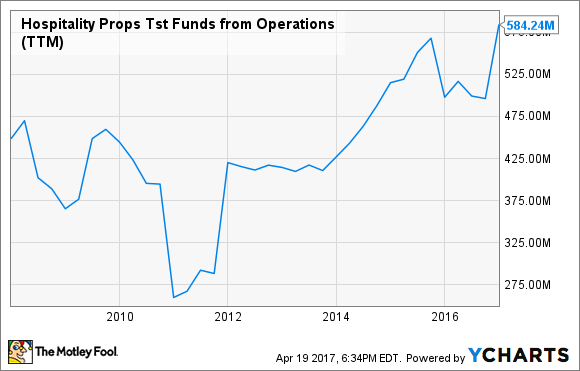 Adjusted funds from operations (FFO) -- the most significant profitability metric for REITs -- jumped by 11% to over $561 million. What helps is that its properties are squeezing out more profit. Revenue per available room saw a modest, but encouraging, 4% increase over the year. On a per-share basis, that adjusted FFO result works out to $3.60, which is well above what Hospitality Properties Trust doles out in its dividend -- which, in calendar 2016, annualized to $2.03. The company has been on the market for more than 20 years, and in spite of some dips it's generally managed to improve its FFO over that time. I'd feel pretty safe with this payout. Hospitality Properties trust will distribute its next dividend "on or about May 18," to shareholders of record as of April 21. The new payout would yield 6.5% on the REIT's latest closing stock price.